As she rose through the ranks of the Chicago Public Library (CPL), Annie Miskewitch (LAS ’00, MA ’03) made an important discovery about leadership: one size does not fit all. With a staff of 65 and a customer base in the millions, Miskewitch credits the broad perspective she gained at DePaul with helping her guide her team, her patrons and the library’s collections. Miskewitch worked at the library as a circulation clerk while she was earning her undergraduate degree. After graduation, she missed being in the collaborative environment in LAS so much that she earned a master’s degree in writing. Her rigorous LAS education prepared her to get an online degree in library science from the University of Illinois, enabling her to become a full librarian. Miskewitch, who’s been a division chief for four years, says her liberal arts experiences make her an effective team leader. “I think the liberal arts at DePaul exposed me to the human condition and how people respond at different times, how we behave, how we interact. Those skills always come into play with whatever you’re doing,” she says. They are also pivotal to keeping the library’s collection responsive to the changing interests of patrons. She draws on her broad knowledge base, careful listening, and attention to news and trends, not to mention her own love of reading. There is a compilation post on Instagram containing pictures of Sean Conlon (SNL ’16). One photo is of him in Ireland, a week before he immigrated to the United States in 1990, staring at the camera with a look of confidence and determination. Another shows him outside of a Chicago apartment building wearing paint-splattered pants and a Bears shirt, standing on top of a dumpster pushing down trash. The last picture is a publicity shot taken at the 2017 Winter Television Critics Awards, where he spoke to a crowd of hundreds about CNBC’s hit show “The Deed: Chicago,” which he hosts. In his late teens, Conlon studied at the Dublin Institute of Technology, but financial necessities forced him out after a year. He moved to London and worked for Lehman Brothers, which was one of the largest global banks at the time. “That all sounds very easy, but I probably applied to 50 places before I got a job at Lehman, and it was a very low-level, back-office job,” Conlon remembers. When he was 20 years old, he decided to immigrate to the United States. Almost immediately after graduating from DePaul, Conlon started filming CNBC’s television show “The Deed: Chicago.” As the host of the Chicago episodes, Conlon helps people who get into distressing real estate deals by lending them his own money and helping them fix the deal. “It’s not like those complete makeover shows. There’s a dark, tough side to it,” he explains. “These are real people who get into a real problem and I go and help them. I’m more about the people than the real estate. You can apply all the logic to location, but when you’re doing a property rehab or flip, it’s the people.” “The Deed: Chicago” premiered in March. Meet an alumna whose idea of success is helping others reach their full potential. Certified executive coach Monika Black (CSH PhD ’12) is the type of person who hears “yes” when others hear “no.” Where most people see obstacles, she sees opportunities and options. This fearless tenacity and optimism, not to mention a tough-as-nails work ethic, laid the foundation for Black’s entrepreneurial career path and gave her the gumption to achieve three advanced degrees. Black is the co-founder of TandemSpring, a consulting firm that helps organizations and their employees leverage their strengths, as well as chief strategy officer at DyMynd, which empowers women to become financially savvy. Both companies use strengths-based assessments to guide clients in meeting their personal and professional goals. Black is a maximizer—it’s her primary strength, and it shows in everything she does. As an undergraduate at the University of Michigan, she was discouraged from majoring in pre-med because she was a standout track star in the high jump. “They told me it was going to be really difficult for me to manage everything,” she remembers. Black didn’t even blink. Not only did she excel in her classes—including her favorite course, organic chemistry—but also she was a four-time All-American, three-time track-and-field captain and winner of the Big Ten Medal of Honor for excellence on and off the field. Black remembers fans complaining that she didn’t run a victory lap after winning her event at the Prefontaine Classic at the University of Oregon because, true to form, she was sitting on the track writing a paper. “I love to work, and I love to work hard,” Black says. She regularly puts in 10- to 12-hour days, but it’s clear that this effort brings her joy, whether she’s leading a workshop, coaching a client one on one or aligning an organization’s strategies with its stated goals. “Helping people reach their full potential in life—that’s what motivates me,” she says. As a doctoral student in DePaul’s community psychology program in the College of Science and Health, Black found the tools to articulate her vision: “I’m always trying to understand the research and the data, but I also want to know, ‘What do those numbers mean for the people actually living that experience?’” She uses this ecological framework to help her clients recognize the overlapping influence of personal, environmental and social factors on their dreams, abilities and achievements. Katherine’s path to entrepreneurship included stops at a biotech start-up, a large pharmaceutical company and a law firm focused on litigation. “After I graduated from DePaul, I never had a problem finding a job because not only did I have experience working with the various analytical instruments used in the pharmaceutical field, but also I had co-authored multiple publications,” Katherine explains. She recalls working closely with Professor Gregory Kharas in the polymer organic chemistry lab and publishing extensively in that area of study. This experience paid off when a California-based start-up hired Katherine as a polymer chemist. When the company went under, Katherine found work as an analytical chemist and was on track to become a research scientist in organic chemistry, but she decided to return to school for a second advanced degree. Back at DePaul, Katherine joined a cohort of students studying patent law. 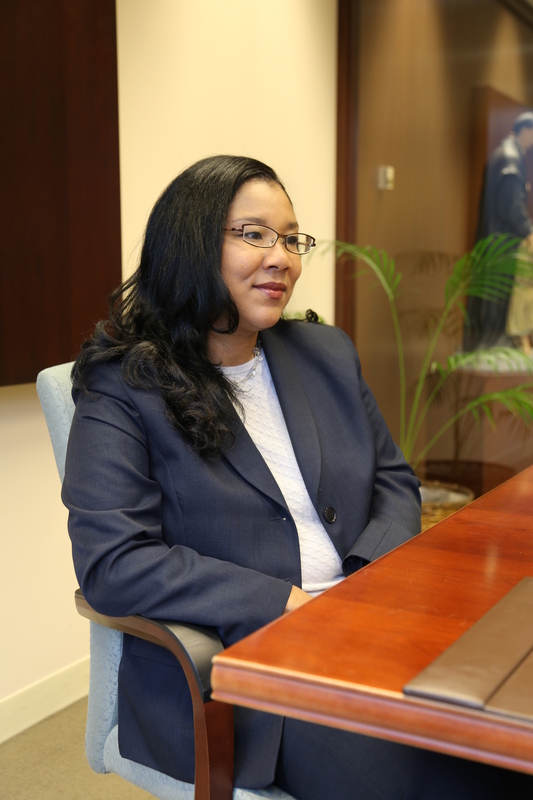 Even though she missed the labs and research projects that played such a central role in her first program at DePaul, Katherine followed through on law school and soon found herself working grueling hours as a novice attorney. “I decided I didn’t like law at all,” she admits. “But somebody gave me a small client, I helped them out, and I enjoyed it so much that I started trying to get other clients.” This shift ultimately allowed Katherine to find a career at the intersection of her dual degrees. Alumnus Jack Cummins (LAS ’88, JD ’92) has offered his support of $25,000 if 450 donors make a gift during the Blue Demon Challenge on Jan. 28. Why do you give to DePaul? would be the first in their families to go to college wouldn’t get that opportunity. These students go on to become important contributors not only at DePaul, but in their professional lives and in the greater Chicago community. Alumni support enables DePaul to remain a positive force in the community, maintaining and improving its efforts to offer access to education to all who seek it. You made your first gift 23 years ago. How has your perspective on giving changed since then, if at all? Jack: I made my first gift to DePaul while I was still a law student. Back then, my goal was to give back at least what I’d been given. DePaul offered me academic and athletic scholarships as an undergraduate, and I wanted to repay the opportunities DePaul afforded me. Since then, I’ve determined that giving back should not be seen a one-time repayment, but as helping our university meet its annual need for support. I’m pleased to know that recently many alumni have supported DePaul during the Blue Demon Challenge. Making a matching gift is my way of encouraging even more fellow alumni to come together in support of our alma mater. Why is it important for alumni to give back? What would you say to alumni who haven’t made a gift yet? Jack: It’s time to start. Alumni may not realize that part of the reason we were able to receive scholarships or study in the library or experience the courses that changed our lives is because alumni who came before us intentionally chose to make a difference. I started by giving what I could afford. There’s no better time than now—during the Blue Demon Challenge—to make your first gift. To make your Blue Demon Challenge gift, visit alumni.depaul.edu/bluedemonchallenge! After eight years as a working professional, J. Mori Johnson (CMN MA ’03) noticed a trend. “Basically, I realized that all of my mentors had master’s degrees,” Johnson recalls. While Johnson enjoyed her work at the American Medical Association (AMA), she felt ready for new challenges and opportunities, and she knew that a master’s degree in the right field could make all the difference. When she discovered DePaul’s organizational and multicultural communication program, she almost couldn’t believe her luck. “From my very first class, I knew that I had made absolutely the right decision,” Johnson says. Most of Johnson’s fellow students also brought work experience into the classroom, which led to energetic discussions and debates. “We all had real-life examples of both successful and failed organizational communications,” Johnson explains. “I liked that I could apply my current job to the theories we learned in class.” Although Johnson didn’t know it at the time, she also took classes that ended up being highly relevant to her current role as AMA’s director of sections and special groups. “I work with physicians trained abroad who practice in the U.S., so I use concepts from Bruno Teboul’s assimilation class nearly daily,” Johnson says. As new physicians navigate the assimilation process, Johnson provides resources and tools to help them adjust to a new culture without sacrificing their own. Additionally, she assists their colleagues in understanding cultural differences on a wide range of topics, ranging from interpretations of eye contact to handling confrontation. Johnson’s varied responsibilities ensure that no two days are the same, but she doesn’t hesitate when asked about the best part of her job. “It’s the physicians, without a doubt,” she enthuses. “I love hearing their stories and helping them to accomplish their goals in the areas of eliminating racial and ethnic disparities in health care, raising awareness of GLBT issues and giving international graduates the tools to enter the physician pipeline.” One of her favorite initiatives connects minority physicians with minority students. Through the AMA Doctors Back to School program, students learn about careers in medicine and get the chance to meet realistic role models. “The number of underrepresented physicians in the profession is very low in relation to the patient population, so we’re working on increasing diversity,” Johnson says.